The ancient city of Gamla located at the southern part of the Golan holds importance in and historical and archaeological sites. Gamla also played a big role in the Jewish revolt. Being one of only the five cities ever to rebel against Rome. Gamla is also a symbol of heroism to the people of Israel. Gamla Jewish history began during the first century B.C.E which was founded by King Alexander Jannaeus between 83-80 B.C.E. Gamla was a Jewish town that a had a population of 5,000 farmers. Josephus (Successor to King Alexander) the Commander of Galilee lead the revolt against rome in the Jewish Revolt. Also in 66 CE ge fortified Gamla as his main stronghold on the Gloan. He gave a detailed description of the city and described the Roman siege under the command of vespasian, which later lead to the conquest in 67 CE. 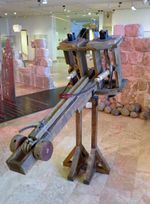 Rome's first attempt to capture Galma was not a success because they used a siege ramp, and they were easily turned back by the defenders. Rome’s second attempt to take Galma was a success because they penetrated the fortification and conquered the city. Thousands of Jews were slaughtered while others committed suicide by jumping off the cliffs. Ever since then Glama was never rebuilt and never discovered until 1970. Gamla was built on a hill between the valleys of the creeks Gamla and Daliot. The city was structured on a small saddle of the basalt ridge while also being surrounded by deep gorges. This gave Gamla a storage advantage in defense if ever in battle. There was also only one road the approached the city and that was from the east. The entrance to Gamla was well fortified by a wall. The wall was built of square basalt stones that were up to 6 m thick. But the city was located on more on the gentle southern slope. Also along the wall were square towers and on top of the hill on the northern side were round towers. The towers were built a lot earlier than the wall and before they were attacked. On the western side of the city was the area where the rich lived. The capital of the city Golan which lasted for about 150 years was well known for its High-Quality Olive Oil. The Olive Oil was produced a lot during the time of Herod the Great. Gamla was also a typical Jewish settlement that was used for a matter of worship to God. Just recently archaeologists have discovered an ancient synagogue and also a lot of other different ritual objects. At the beginning of the first millennium the Romans turned the Jewish Kingdom into Judea the Gmailites played a large rule in the struggle for independence. The siege of Gamla started during the Jewish against Rome. Josephus Flavius, the commander of Galilee against the Romans fortified Gamla as his main stronghold on the Golan. Josephus gave a very detailed description of the topography of the city which he called Gamala. The steep ravines that the city already had made it easier for Josephus because he did not need to build a wall. On the northern side of the saddle which was the towns eastern extremity, there was a 250 meters-long wall built. This gave them a good advantage against the Romans. Before the Gamla revolt on Rome, it used to be loyal to Rome. Gamla turned rebellious due to the influences of foreigners from other areas. Gamla was one of the five cities that rebelled against Rome and the Vespasian’s legions. Vespasian was the current emperor of Rome at the time. The city endured the first seven-month siege, which was put together in 66 CE by Herod Agrippa II. On the date of October 12, 67 CE Vespasian's army of 60,000 soldiers began there the second siege on the city. According to Josephus citizens of the city and the rebel army only combined to 9,000. This number is said to be exaggerated because before the siege Gamla became a refuge city. Since 2003, the territory of the Ancient City Gamla has now been incorporated into the Gamla nature reserve which is open to tourists. 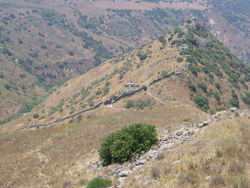 Included in the ancient city of Gamla is also the highest waterfall in Israeli-occupied territory. On some occasions, religious visitors will hold bar mitzvahs in the ruins of the ancient Gamla synagogue. Unfortunately, in May of 2010, the remains of the ancient city were damaged a lot more during a fire which was caused during a military exercise. In Israel, there is a catchphrase that says “ Gamla will not fall again” meaning that even today it holds importance to the safety and security of Israel. This page was last modified on 24 January 2019, at 16:36.